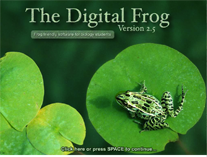 The Digital Frog 2.5 is an even better way to learn about frog dissection, anatomy and ecology than its award-winning predecessor, The Digital Frog. The comprehensive, interconnected modules teach all the major body systems with full-color photographs, full-motion video, narration, and detailed animations (including 3D). Human anatomy comparisons show how we differ from frogs. The interactive map, context-sensitive help and definitions on almost every word ensure you never get lost. Integrated text-to-speech provides support for visually-challenged and auditory learners. Interactive quizzes provide formative assessment. This program and the electronic workbook materials can replace or supplement traditional frog dissection. Use it in the classroom, computer lab or for independent study. It?s a truly interactive and fun way to learn! Suitable for Grades 5-12, although younger students find plenty to enjoy such as listening to the frog calls. All educational licensing includes public performance rights - ideal for use with an interactive whiteboard. Lifetime licensing is valid in perpetuity: the number of computers depends on the number of seats purchased. Prices start at 155.00. Click on the image to select the number of seats. All educational licensing includes public performance rights - ideal with an interactive whiteboard. Annual license code is valid for 1 year from activation on the number of seats purchased. Prices start at $160.00 for five computers. Click on the image to select the number of seats. The Home License includes the same content as the educational versions but, just like the DVDs you buy, is licensed for home use only. Ideal for homeschoolers. it is licensed for three computers in your home with no expiry date. La grenouille digitale is now available. This is the same great program as the Digital Frog, now in french. All educational licensing includes public performance rights - ideal for use with an interactive whiteboard. Lifetime licensing is valid in perpetuity: the number of computers depends on the number of seats purchased. Prices start at 155.00. Click on the image to select the number of seats. La grenouille digitale is now available. This is the same great program as the Digital Frog, now in french. All educational licensing includes public performance rights - ideal with an interactive whiteboard. Annual license code is valid for 1 year from activation on the number of seats purchased. Prices start at $160.00 for five computers. Click on the image to select the number of seats. Save time, save money AND engage your digital students. Students can complete the worksheets on any device that supports Acrobat Reader 11; they can then email or upload them. You review the work and select marks for each question from a drop down list. Totals and percentages are calculated automatically. One low price offers unlimited use within one school. Save your school money on printing and paper consumption.